In general, the dryers used are based on those found in chemical, pharmaceutical and agri-food industries. These existing technologies have had to be adapted to properties specific to sludge. mixed dryer : a combination of the two preceding systems, the first part of the drying process takes place in an indirect drying zone and the second in a direct drying zone in regards to the Evaporis™ LE dryer, or simultaneously in the same zone (as in the Vomm dryer). For some technologies, the presence of a high viscosity phase is incompatible with dryer operation. In this case, in order to avoid this aspect, constructors use an intensive recirculation of dried products to the system’s inlet so that the feed rises above the critical dry solids contents threshold or, as a safety margin, to at least 65 % (see figure 5). 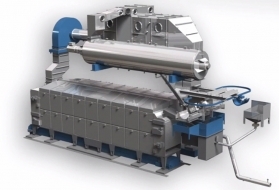 Consequently, there is a range of intensive external recirculation (300 to 600 % of incoming DM) dryers that can then be used as direct or indirect dryers. A pregranulation stage that occurs during the intensive recirculation phase will provide the end dried product with the properties of a granular product requiring no subsequent formatting stage. Even if intensive external recirculation implemented in some dryers enables the plastic phase to be overcome, the uniformity of the mix and flow control are very difficult to obtain. Other constructors have developed a technology that allows the dryer itself to cope with a high viscosity phase. 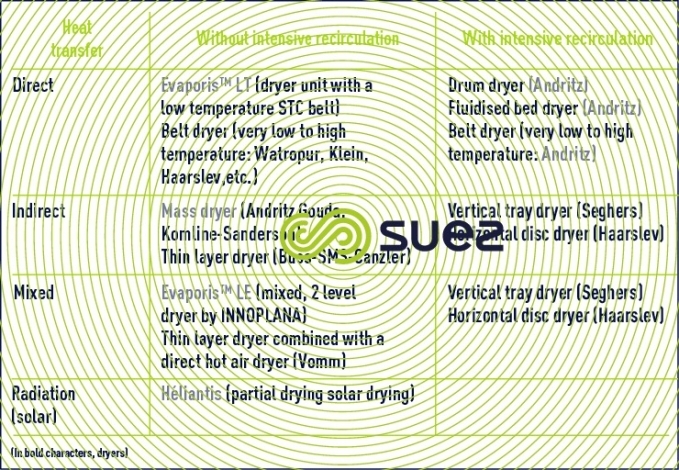 This range of dryers concerns indirect or mixed dryers. Depending upon the drying technology used, dried sludge is obtained in various forms (granules, pellets, fines) and densities. 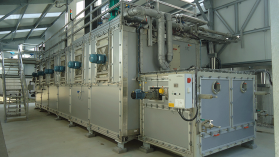 Other sludge drying technologies exist but are not yet mature (drying using rays (infrared, high frequency microwaves)), drying by frying, drying through mechanical steam compression, etc...).